Scottsdale Links Resort in Scottsdale, Arizona - Buy a 7 Night Stay in a 1, 2 or 3 Bedroom Suite! 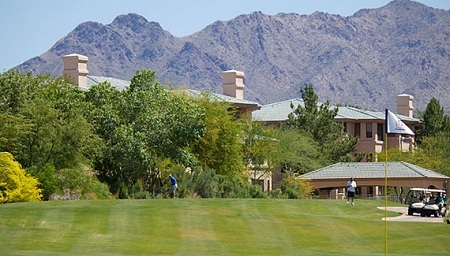 Enjoy 7 nights in a 1, 2 or 3 Bedroom Suite at Scottsdale Links Resort in Scottsdale, Arizona! The Scottsdale Links Resort showcases elegantly appointed all-suite accommodations with private patios that provide guests the ultimate in convenience and luxury complete with a fitness center. Vacationers interested in the magic of Scottsdale, Arizona, will find this resort nestled between the TPC Desert Golf Course and the breathtaking McDowell Mountains offering a host of scheduled activities, tennis and relaxing pool and spa-side areas. The resort is three stories and there are no elevators. full oven, toaster and a washer and dryer. Your 1 Bedroom Suite sleeps up to 4 people with a full kitchen. It has one full bath, one king bed in the master bedroom and a queen size pull out sleeper sofa in the living room. UPGRADE TO A 2 BEDROOM SUITE ON THE FOLLOWING DATES FOR ONLY $75 FOR THE ENTIRE WEEK! UPGRADE TO A 3 BEDROOM SUITE ON THE FOLLOWING DATES FOR ONLY $150 FOR THE ENTIRE WEEK! Check-In Dates Available for 7 Nights in a 3 Bedroom Suite!